"Chas's mum and my mum have worked together for years and my mum was always telling me about 'Mrs. Cronk and her little boy' and how well he was doing. And Chas's mum was going back and saying 'Mrs. Cousins has been telling me all about David' - and of course he hated my guts. Then it turned out he was a friend of Rick's and we were both playing on a session [for Wakeman's Six Wives Of Henry VIII album, on which Cronk played bass and Cousins played banjo] and I thought 'what a nice bloke.'" Chas began playing bass when he first started work, turning pro whilst playing with school friends in a band called Mosaic. He supported his musical activities by working as an industrial photographer for the Gillette razor blade company. At 17 he had a deal with Denny Cordell's Regal Zonophone publishing company. Whilst he didn't record an album as such he got a lot of studio time and experience through Cordell. At the studio he met Jimmy Thomas, then working with the Ike and Tina Turner band and formed a band with him. Thomas worked with Chas on and off for quite some time; it was during this period that Chas met Rick Wakeman, who was playing in a show band which played at weddings and functions. They hit it off and ended up doing a number of sessions together through Regal Zonophone. He also met Tony Visconti, later to work with the Strawbs, and Dave Lambert. Chas, Dave Lambert and Dave Cousins were all featured on Rick Wakeman's solo album Six Wives Of Henry VIII, on the track "Catherine Howard", after which Chas went off to join the Phillip Goodhand Tait album, playing on the Songfall album, released in 1972 (DJM, DJLPS 425). He joined Strawbs in the summer of 1973 and stayed with the band until its disintegration after Cousins' departure in July 1980. When Strawbs reformed in '83 it was the For/Hudson line-up which sprang back into life. Chas meanwhile carried on with sessions work, and went on to work with Roy Hill as Cry No More, scoring some success in Germany with a single "Oh Sharon". Cry No More recorded several albums and released a few singles, but ultimately didn't achieve major success. Today Cry No More continues to perform on an infrequent basis, delighting the faithful who turn out on each occasion, and who arguably know the words of the songs better than Roy himself. CNM supported Marillion on a recent UK/European tour. Having assisted in various mastering/recording work over the years, he played on 1994's The Bridge. As Dave's ambitions to recreate the Hero And Heroine band at Chiswick came to fruition, Chas played that night, and was back in the US Electric line-up for 2004's US/Canadian tour. 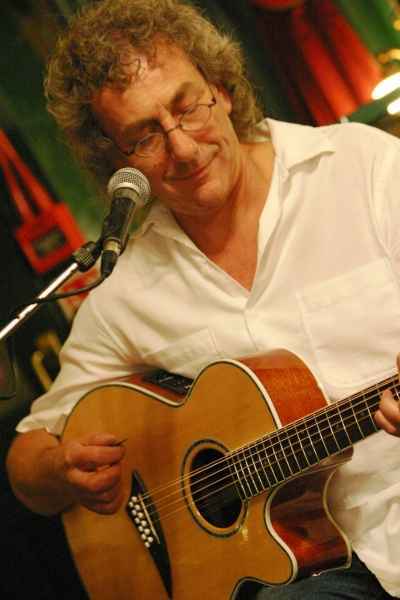 On Brian Willoughby's departure from the Strawbs in 2004, there seemed no more obvious recruit than Chas, who in addition to bass, plays 12-string and bass pedals, which has added a new dimension of musical textures to the Acoustic line-up.